Brief Synopsis – A mercenary tries to get smuggled weapons to a far off province of China that is rules by a merciless warlord. My Take on it – This is yet another film that I had never heard of before seeing that one of its cast was nominated for an Oscar for their perfromance here. The premise of the film is a bit intriguing but overall is all comes across as being quite average. 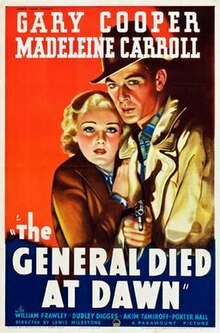 This film was directed by Lewis Milestone who was a visionary director and he does some nice things with the way he tells this story yet they don’t manage to enhance things enough. Gary Cooper is fine in the lead and has ok chemistry with his leading lady Madeleine Carroll yet something still feels missing from the way they give their performances. Akim Tamiroff is quite good as the Chinese warlord and managed to get an Oscar nomination for Best Supporting Actor for his performance in this film largely due to the fact that he does some nice and risky things with the role. This film has some interesting cinematic decisions along the way, but unfortunately even those don’t manage to make this film that memorable. Bottom Line – Intriguing premise that comes across as being quite average. They do some nice things with the way this story is filmed yet still doesn’t find a way to enhance the story itself. Cooper is fine in the lead and he has nice chemistry with Carroll but something is still missing from the performances shown. Tamiroff was nominated for an Oscar for Best Supporting Actor for his role as the Chinese warlord and does a some nice things with the character. Milestone was a groundbreaking director and used some interesting ideas with this film but even they can’t make this film even more memorable.